So, you’re considering doing a Class Play or you’ve started practices. Now, you’re wondering how to get students really working and eventually evaluate them. But how do you go about evaluating drama? It’s a process, right? It’s subjective, I hear you saying. 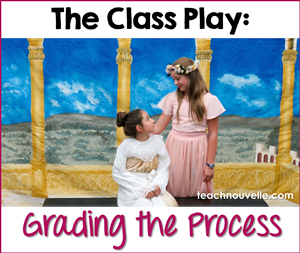 Read on to see how I graded students on their effort and achievement in the class play. In the last post, I talked about the first few practices of a Class Play and how to incorporate theatre mini-lessons. One of these, Blocking, becomes more and more important as the practices continue. Once students are “off-book” (memorized), they need places to go on the stage. Young actors need to know that blocking is part of building consistency as an actor. Your fellow cast members need to be able to count on you to arrive at a certain spot at a certain time. One of our biggest blocking challenges in A Midsummer Night’s Dream was the Catfight. Getting all four actors to get from point A to point B in the same amount of time, every time, required planning. Still, once students know that blocking creates safety on the stage, the magic happens – Hermia lunges at Helena, only to be pulled back by the boys, and the audience gasps in appreciation! Understudies, Input, and Saving the Day! I told you at the beginning of this adventure that I cast understudies for every single part in the play. Part of this was out of necessity – I had two classes working on this project together, so I needed Hermia in one class and her understudy in the other so that all of the actors could work productively during class. For the other part, I wanted students to give constant input. The understudy system meant that two people felt invested in every role, and felt that they could make suggestions. This worked out beautifully for us, and the input of understudies made two of the woods scenes so much more interesting. Then, a week before the show, my lead fairy (you know, the one who has a monologue and mocks Puck?) tore a ligament. Ouch! Luckily, the understudy was ready to go, and she was amazing! Three days before the show, Flute got mono and couldn’t perform. His understudy stepped up in a major way and even memorized his lines by the time they performed for the middle school! The night of the Parent Performance, Quince just didn’t show up, and the understudy (who was also Egeus) had to go on. Hooray for these stellar understudies! They knew the motto: the show must go on! A big question my teacher friends asked when they heard what I was doing was how I was evaluating drama in the ELA classroom. My students worked on this play for four weeks of class time, so how did I keep the gradebook up-to-date? Subjective assessment of student reflection on soft skills. 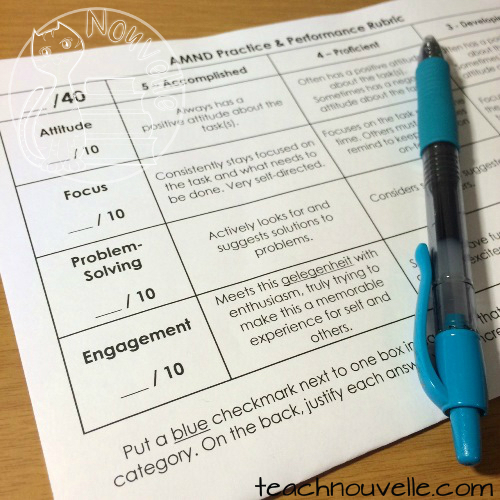 I distributed a rubric with descriptors about attitude, focus, problem-solving, and engagement. As they wrapped up practices and performances, students had to self-assess, writing justifications for each score using concrete examples. For example, to get a “10” on problem-solving, a student had to describe a problem that s/he actually solved. This rubric made evaluating drama in the classroom much easier, and students began reflecting on the process. Click on the image to see my Drama Unit at TeachersPayTeachers. Whatever grading strategy you use, make sure that your students know how it’s going to work before starting rehearsals. My students need to know that they are expected to solve their own problems, and we have to brainstorm what focus looks like. That’s it for evaluating drama in the ELA classroom! In the final entry of the series, I’ll let you know how our performances went, and give you some ideas for extending the reach of your class play.